The AWPA is the leading voice of the ferrous wire and wire products industry in North America. AWPA members include wire producers located in the United States, Canada and Mexico, manufacturers and distributors of wire rod, and suppliers of machinery, dies, and equipment to the wire industry. Manufacturers of ferrous Wire and Wire Products, located in the United States of America, make up the voting members of the association. Presidents, CEOs, Purchasing Managers and other senior level company leadership all participate in meetings and activities of the association. Operations staff are also involved in meetings and association programs. Canadian and Mexican Wire Manufacturers and Suppliers to the industry are involved at every level of leadership and programming. Ferrous adjective fer·rous \ˈfer-əs, ˈfe-rəs\ Ferrous is an adjective used to indicate the presence of iron. The word is derived from the Latin word ferrum (“iron”). Ferrous metals include carbon steel, stainless steel and alloy steel. Ferrous Wire and Wire Products are Everywhere. AWPA member companies make hundreds of kinds of wire and wire products including bright, galvanized and tempered wire; wire mesh, netting and fencing; wire strand and rope; and garment hangers and nails. AWPA Committees are the venue to discuss issues of importance to the industry. See a list of AWPA staff members or send an email. Do you need to find a Wire Manufacturer or a Wire Product Manufacturer? Search the AWPA members and get a list of manufacturers that make the products you need. We’ll provide the Company Names, Locations and Sales Contact information for your future suppliers. AWPA Members enjoy face to face meetings 3-4 times per year where they can check in with colleagues about the important challenges of the day. To provide an educational, interactive industry forum and lobby that supports and promotes global competitiveness, and acts in the best interests, of North American wire producers. 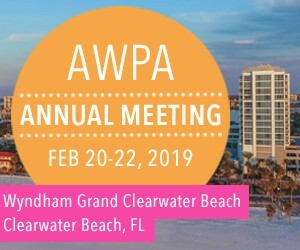 AWPA’s Annual Meeting was a Success in Florida! Information on the event is here.